Dr. Brad Agan graduated from Logan University in 2015, attending school just outside of St. Louis. His first step was to work with a chiropractor who became his mentor and guide in the world of chiropractic care. 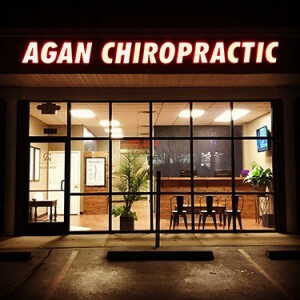 When it was time to branch out on his own, he found the space for Agan Chiropractic and knew it was the perfect place to start his practice. Together, Dr. Agan and his father worked side-by-side to make over our chiropractic office, completing the woodwork by hand and putting on the finishing touches to our healing space. The comfort and care you’ll feel from the moment you step in is the first step in your recovery journey with us! Chiropractic has been around since the late 1800s when D.D. Palmer discovered the power of the chiropractic adjustment. As a chiropractor, Dr. Agan’s philosophy is to use your symptoms as clues to find the cause of your problem. Think of when you have your tires rotated and your car aligned. You noticed something was worn when you saw that your tires were wearing unevenly. The source of the issue was that the alignment of your car was off, not that the tires were balding. With a detailed consultation and examination, Dr. Agan will locate areas of your spine that are under stress. Then, he provides gentle, accurate adjustments to the area to get it moving properly. Over time, you’ll likely notice that your symptoms dissipate. You can think of aches, pain and illness like a check engine light coming on, letting you know that something isn’t quite right. Chiropractic can be used to keep you tuned up so that you don’t have to experience discomfort, take medications or resort to surgery. Dr. Agan provides the precise adjustments that allow your body to work as it was intended to, healing itself. There is a myriad of conditions that respond well to chiropractic, even when people have thought or been told that they’re stuck living with their problem. One of Dr. Agan’s patients is a young man with muscular dystrophy, which is a type of autoimmune disorder. He’d been told that multiple surgeries would be necessary and that he would never walk normally again. His parents brought him in once a week, saw incredible results and asked to increase his visits to twice a week. The remarkable improvement in his mobility has allowed him to live a better life, allowing the body to do what it needs and restore health. If you’re ready to learn more about what Dr. Agan can do for you, contact us today! Insurance coverage can be used for your visits.